PESTO – WHO KNEW IT COULD BE SO GOOD? | Cook, Party, Enjoy! PESTO – WHO KNEW IT COULD BE SO GOOD? Summer’s Fresh Basil the basic ingredient for PESTO. And this summer I have discovered at long last Pesto! I have to be honest here, when I would read that a recipe included pesto I immediately left it alone. I had no clue as to what pesto was nor did I ever really try to find out. For me it just sounded strange and since I hadn’t heard of it I felt it must not be worth looking at. And I was wrong. Pesto does have its place and quite frankly it is pretty good when combined with Italian style cold cuts, sliced turkey and cheese, meats and other fixens. To save you from trying to find recipes I have included here some that I have used. I am not crazy about pine nuts so I often make mine with pecans, my favorite nut. 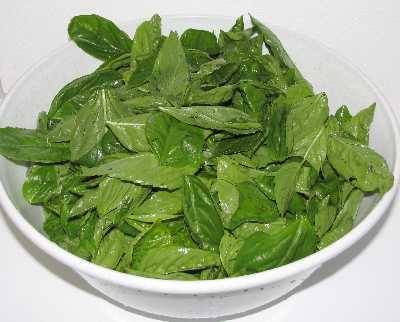 Wash and dry the basil in a salad spinner. Toast the nuts – I toss them in a hot, dry, cast iron skillet. Put the garlic in the food processor and chop fine. Add the basil and most of the olive oil. Chop finely. Add Parmesan cheese and nuts. Chop just a bit – I like the nuts to be still chunky. Add salt if desired. Add olive oil if thinner consistency desired. Finely chop half of the basil and half of the walnuts together in cap of Food Chopper (mixture should resemble a thick paste); place into Classic Batter Bowl. Repeat with remaining basil and walnuts. Using Microplane® Adjustable Grater, finely grate cheese. Add cheese, oil and garlic pressed with Garlic Press to batter bowl. Mix well using Small Mix ‘N Scraper®. 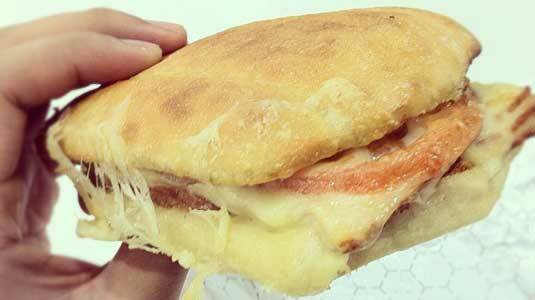 I always use a Parmesan/Romano blend because I feel it has a richer Italian flavor. Pour into your blender or food processor and Blend 8 cups packed fresh cut up basil leaves, 1 cup extra virgin olive oil, 1/2 cup toasted pine nuts, 2 to 4 garlic cloves and 1/2 teaspoon salt in a food processor or blender until almost smooth. Stir in 1/2 cup grated Parmesan. I always use a Parmesan/Romano blend because I feel it has a richer Italian flavor. 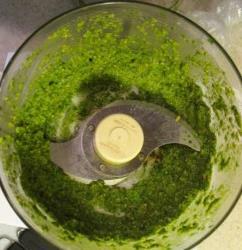 Peanut Pesto easier to prepare in food processor. In bowl of food processor or blender, place peanut butter, garlic, ginger root, honey, vinegar, sesame oil, soy sauce and cayenne pepper. Process until smooth. *Toast your nuts for richer flavor. You can do this in a skillet or in the oven. You just want to heat them up and toast them lightly to heat up the natural oils and bring out their flavor. Lemon-Pesto Dip – Whisk together 1/2 cup sour cream with 1/4 cup each mayonnaise, Parmesan and pesto, Add 2 tablespoons capers and 2 teaspoons each lemon zest and juice. Stir to combine. Season dip with salt and pepper to taste. Pesto Pom Frites Sauce – Whisk together 1/3 cup mayonnaise, 2 tablespoons each pesto and extra virgin olive oil, and 1 tablespoon lemon juice. Serve with hot French fries. 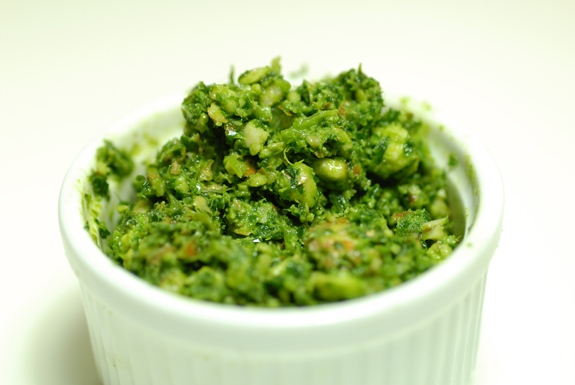 Pesto Butter – Combine 3/4 cup chunky pesto with 1/2 stick of softened butter. Mash together until well combined. I do this with the paddle in my Kitchen Aide Mixer on low. It works perfectly then I press the pesto butter into a crock with a cover to keep in refrigerator until I use it. This is great on steak, pasta, anything you might want to use a flavorful butter. Try it on corn on the cob. Grill or steam corn, then brush with Pesto Butter. Sprinkle with grated Parmesan. Pesto Shrimp – Marinate 1 pound shrimp fresh or frozen in 2 tablespoons each pesto and olive oil; add 1 lemon (cut into wedges) and 1/2 teaspoon red pepper flakes. Grill about 3 minutes per side. Season shrimp with salt and pepper to taste. Pesto Steak – Mix 1/4 cup pesto, 2 tablespoons white wine vinegar and 1 tablespoon hot water. Grill or broil 1 1/4 pounds skirt steak; brush with the pesto just before serving. Pesto Chicken Wings – Marinate 2 pounds chicken wings in Mixture of 1/2 cup pesto and 1/4 cup each cider vinegar, hot sauce and honey for at least 2 hours, preferably overnight. Roast at 425 degrees F, 40 minutes. Toss with chopped basil and mint. Pesto can be used on chicken top chicken with pesto bake at 375 about 35 minutes sprinkle with chopped peanuts and sliced green onions when cooked. Pesto Roast Whole Chicken – Mix the juice of 1 lemon, 1/3 cup pesto and 1 teaspoon red pepper flakes; rub onto a 6-pound whole chicken. Stuff with peeled whole garlic cloves and one quartered lemon. Roast in a 375 degrees F oven, about 2 hours. Pesto Swordfish – Mix 1/4 cup pesto with the juice of 1 lemon and 1 tablespoon hot water. Spoon over grilled or broiled swordfish. Pesto Hummus – Mix 1 cup hummus with 2 tablespoons pesto. Top with chopped mint, toasted pine nuts and a dash of paprika. Pesto Green Beans – Toss 1 pound steamed green beans with 3 tablespoons pesto and the juice of 1/2 lemon. Easily steam green beans in the microwave, just place beans in a microwave safe bowl, add 1 tsp water, cover and microwave for 3-5 minutes. Perfect every time. Pancetta-Pesto Peas – Cook 4 ounces diced pancetta in a skillet with olive oil until crisp; remove with a slotted spoon. Add 1 bag frozen peas and 1 cup water to the skillet; simmer until tender, 10 minutes. Stir in 3 tablespoons pesto and heat through. Pesto Orzo with Peas – Make Pancetta-Pesto Peas above. Stir in 1 1/2 cups cooked orzo and 2 tablespoons grated Parmesan. Pesto Potato Salad – Boil 2 pounds quartered new potatoes in salted boiling water until tender, 10 to 15 minutes; drain and cool slightly. Whisk 1 cup mayonnaise, 3 tablespoons pesto and the juice of 1 lemon; toss with the potatoes, add 1 cup diced celery. Pesto Succotash – Microwave 5 cups corn in microwave safe dish with cover for 3-5 minutes, remove from microwave and transfer to a skillet. Add 1 cup sliced cherry tomatoes and 1/4 cup chopped red onion with 1 tablespoon butter and sauté until soft, about 5 minutes. Add 2 cups cooked lima beans and 1/4 cup heavy cream; heat through, just before serving stir in 2 tablespoons pesto. Pesto Beans – Sauté 5 sliced garlic cloves and a pinch of red pepper flakes in a skillet with 1-2 TBSP extra virgin olive oil. Add 2 cans cannellini beans drained and 1 cup water; simmer until reduced and thickened, about 8 minutes. Stir in 3 tablespoons pesto and 2 tablespoons grated Parmesan. Pesto Mash Potatoes – Boil 3 pounds peeled russet potatoes until tender. 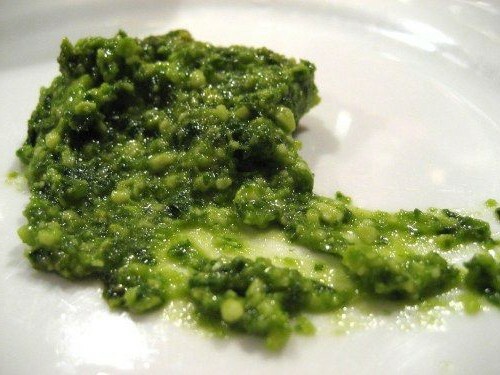 Mash with 1 cup milk, 1/2 cup grated Parmesan, 1/4 cup extra virgin olive oil and 3 tablespoons pesto. Pesto Salad – Whisk 2 tablespoons champagne vinegar and 1/4 cup pesto. Toss with baby greens and serve with baguette toasts spread with Feta cheese (goat cheese). Pesto Caesar Salad – Whisk 2 tablespoons pesto with 1/2 cup Caesar dressing. Toss with romaine and croutons; top with shaved Parmesan. I always use a Parmesan/Romano Blend for the richer Italian Flavor. Pesto Croutons – Toss 4 cups bread cubes, 3 tablespoons pesto and 2 tablespoons olive oil. Spread on a baking sheet; bake 20 minutes at 350 degrees F. When cubing the bread freeze it first it is so much easier to cut up. Pesto Panzanella (or panmolle is a Tuscan salad of bread and tomatoes popular in the summer.) – Toss Pesto Croutons with 2 tablespoons red wine vinegar, 3 tablespoons olive oil, some chopped tomatoes and cucumber, sliced red onion and more pesto. Pesto Chicken Salad – Whisk 3 tablespoons basil walnut pesto with 1/4 cup each mayonnaise and sour cream. Stir in 4 cups chopped cooked chicken, 1/2 cup chopped celery and 1/4 cup each chopped red onion, walnuts and crisp bacon. Pesto Egg Salad – Whisk 1/4 cup mayonnaise, 2 tablespoons pesto, 2 tablespoons olive oil, and 1 tablespoon lemon juice. Fold in 8 chopped hard-boiled eggs, 1 cup chopped celery and 2 tablespoons finely minced red onion. Pesto Tuna Salad – Toss 3oz. cans drained tuna, 1 can drained chickpeas, 1/4 cup each chopped parsley, 1/4 cup red onion and 1/4 cup roasted red peppers, 3 tablespoons pesto and 2 tablespoons red wine vinegar. Pesto Grilled Cheese – Brush 2 slices rustic bread like sour dough with pesto, then layer in sliced cheddar or provolone. Butter the outside of the bread and cook in a skillet over medium heat until golden brown and cheese is all melty. 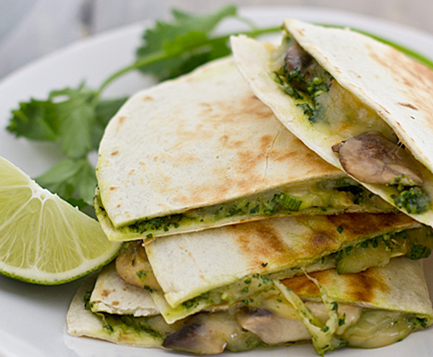 Pesto Quesadilla – Sauté 1/2 cup each sliced scallions, mushrooms and zucchini with 1-2 tablespoons pesto, add minced jalapenos and cilantro. Brown a flour tortilla in a skillet with butter; top with the vegetables, shredded Muenster and then place another tortilla on top, brush with melted butter. Flip and cook until lightly browned on both sides. Quick to make, a delight to eat…pesto adds a subtle flavor of basil and nuts.